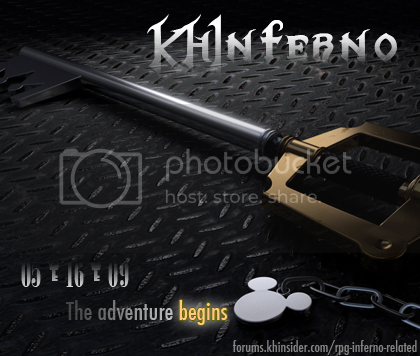 KHI's RPG Inferno is an ongoing game that you can play right in your browser while you're on KHI! You can also talk with and party up with fellow Forum-Goers in an ever expanding universe. You can adventure alone or with a friend and see all that the continent of Waltier has to offer. Explore areas ranging from dense jungles to ancient temples while being hot on the trail of the enigmatic Organization of Shadows. So much for the 18th, right? Slight miscommunication it seems. Explained it best I can in a PM. but good news, I suppose. I'll probably give it a go later. You will be able to play the inferno using a PS3. No, it doesn't work on a PSP. Stop spamming and double/triple posting. It's going to get your posts deleted (thus lowering your post count, possibly giving you negarep, and annoying everyone), and possibly you banned. Works great, haven't had a problem with it yet. Plus, you won't get to play in the Inferno, which is the reason your doing all this. Would it be possible to get a timestamp for the chat? Just feel like I'd enjoy knowing when someone said something. So basically, you're going to risk a ban (and get nega-rep) just to be able to join a RP that you might not be able to join because you're banned. Also, double.. scratch that.. quadruple/ quintuple posting is bad for your KHI health.. very bad.. Oh, and you could always look through the other sections for four other places to post.. btw.. (ignoring the Foyer and FI, where your post count won't go up) and get your five more legitimately, instead of spamming the re-opening thread, but ehh.. whatever suits you. Just watch out for that ban hammer. I heard it can be smashed down quick and hard. I see that a mod deleted your posts. I'd take that as a good warning now and not posting like a one worded post or quadruple post again. There's other sections besides this one. Go find another topic (or three/ four) to post in or something. Also, do you see that FAQ up there? Read through it and the stickies in the various sections as well. who start to made kh rpg? Don't post anymore in here or you can't play the game. i just love kh and it is best True?? Hello, do you see the edit button down on the lower corner of your post, next to Quote? I know you're probably just doing this to get 5 posts, but if it is indeed by mistake, there's an Edit button and I'd recommend you use it. Oh, and if you are trying to get five again, like I said, there are other topics you could post (or spa.. err.. forget that I said that..) in. You don't have to get your five in this thread alone.